Major Jack Carstairs returned from the Peninsula War with a bayonet scar across his face and a crippled leg that left him unable to ride or dance, activities in which he had been proficient before the war, only to face more losses at home. His father is dead, and his disapproval of Jack’s choice of a fiancée led him to disinherit Jack, leaving him only “whatever is found in my pockets on the day I die.” Since the deed to a dilapidated country estate, Sevenoakes, was in the senior Carstairs pocket at the time of his death, Jack, who is too proud to accept help from his relatives, at least has a home of sorts. His fiancée, beautiful but shallow and heartless, is unprepared to be the wife of a man who has lost both his looks and his fortune. Jack jilts her after overhearing her plans to jilt him. Wounded by his father’s unforgiveness and disillusioned by his fiancée, he retreats to Sevenoakes with a single man servant, prepared to drink himself into oblivion. Lady Cahill, Jack’s grandmother, refuses to give up on him and resolves to beard the recluse at Sevenoakes, but first she makes a stop to rescue the penniless, orphaned daughter of her goddaughter. Kate Farleigh is determined not to be rescued; she is prepared to accept a position as a maid and surrender forever the position to which her birth entitles her. Kate’s upbringing has been unconventional in every respect. Her father, who could not forgive his only daughter for the loss of his beloved wife in giving birth to Kate, left her “to run wild as a weed.” Kate not only “never learned to be a lady”; she learned cookery and housekeeping skills no lady of her class would ever know. At seventeen, she accompanies her father as he follows her two brothers who, like Jack, are fighting in Wellington’s campaigns. Kate has three happy years, despite the deprivations and suffering of war, using her unladylike skills to care for the men of her family. However, when her father and brothers are killed, Kate becomes another victim of war. Kate is too proud and too frightened of her reception in London to accept help from Lady Cahill, but the grande dame refuses to accept Kate’s refusal. She kidnaps her and takes her to Sevenoakes where Kate finds a role she can accept as a much-needed housekeeper for Jack. The two strike sparks off each other as they argue about Kate’s role and Jack’s choices and try to resist their attraction for one another. What follows is sometimes comic, sometimes poignant and always compelling as these two wounded survivors heal one another. I first read Gallant Waif the year of its U.S. release because it was a big buzz book on All About Romance, and I fell in love not only with the characters but also with the author’s voice and the world she created. I read Tallie’s Knight within weeks of reading Gallant Waif and I haven’t missed an Anne Gracie book since. 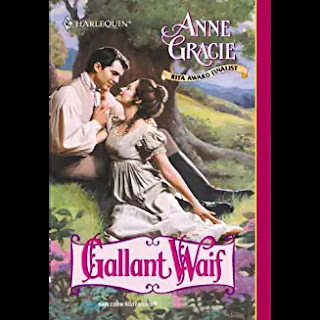 My romance-reading friends who know me best have all heard me rave about many Anne Gracie books over the past sixteen years, but Gallant Waif remains my favorite—and the one I have reread most often. One of the things I like best about this book is that, despite obvious differences in economic status and family support, Kate and Jack are very much alike. Both are veterans of a cruel war that left them scarred. Jack bears some of his scars visibly, but both bear irrevocable scars on their souls. They also share the experience of having their illusions about their “beloved” brutally shattered by the way the object of their affections responds to the war wounds. Jack’s anger and grouchiness cannot hide his fundamental decency and kindness, and Kate’s pride and temper cannot hide her vulnerability and courage. I loved both characters from the beginning and was invested in their HEA from their first meeting. Lady Cahill gave her granddaughter a look of magnificent scorn. "Don't be ridiculous, Amelia!" not even my favourite grandson, tells me what I may or may not do! This book also contains one of my all-time favorite scenes. Kate's worst fears are realized when she is snubbed at a ball and whispers about her circulate. Her partner abandons her on the dance floor, which has emptied. Her body began to shake. She could do nothing. There was no standing up to insubstantial whispers from people who would not even look her in the face. She forced herself to keep walking, desperately hoping the trembling of her body was not visible to the observers. Was there ever a room so long? Only four more steps. A powerful black-clad arm snaked out of the dense crowd and pulled her into the centre of the circle again. “I think you must have forgotten me, Miss Farleigh,” said Jack. His normal tone of voice carried in the watching hush. Kate blinked up at him. “My dance, I believe. Did you forget it?" He smiled down at her bewildered face, his casual manner belied by the implacable grip on her arm. “But...” With everyone listening, Kate couldn't say it. She hadn't promised him a dance. He didn't dance. Not since he was wounded, anyway. He only leaned against walls and columns, glaring at her. So why would he seek her out now? Now, when the world was turning against her again and she wanted nothing more than escape. Kate tried to pull away, but his hold on her was too powerful. Ignoring Kate's glance of pathetic entreaty, Jack moved steadily back through the crowd, towing her beside him, greeting acquaintances in a cheery tone as he went, for all the world as if they were not in the very heart of a major scandal, their every movement watched by hundreds. His uneven footsteps echoed as he led her out on to the deserted dance floor. He finally released her arm, but took her hand instead. Bowing, he kissed it lightly. Kate stared at him in a daze. He grinned at her, a wicked, tender grin. By the end of the scene with Jack, Kate is weeping. So am I, no matter how many times I read this. My tears continue through Kate’s dances with Jack’s friends, and I am ugly crying by the time she dances with two more young aristocrats: a one-armed man and a blind man, both recipients of Kate’s nursing and nurturing on the Peninsula. But I am smiling when Kate takes a “turn around the room” with the guest of honor, Wellington himself. My smile has changed to laughter a few pages later as Kate and Jack achieve their HEA in a fashion true to their relationship. This sounds lovely. I will have to look for this at my library when I return home. It's a wonderful story. Like Janga, I've read all of Anne Gracie's books and this remains one of my favorites. I really enjoy Anne Gracie's novels but I have not read this one. Will certainly put it on my Wish List. Thanks for sharing. Hope you enjoy it, Connie. Great review PJ. I'm currently reading Gracie's Chance Sister novels as these are the only ones available to me on audio. When I finish those I will definitely want to head for the e-books and this sounds like a very good place to start! I loved the Chance Sisters quartet. I also thoroughly enjoyed Marry in Haste, the first book of her new series. As an added bonus, there's a cameo appearance by one of the Chance Sisters! Great review, Janga! Like you, PJ, I want to go digging through my shelves of books and do a re-read. After reading Janga rave about Anne Gracie years ago, I was lucky enough to stumble upon GALLANT WAIF and TALLIE'S KNIGHT at a used book store, bought them both and never regretted it. My favorite books are those that make me laugh and cry! Sounds wonderful!! I am an Anne Gracie fan. I only found her with the 4 Chance Brides books. You have given me something to find and acquire. Thank you so much. Y'all continue to provide me with new books to read. I know that not everyone reads ebooks, but one of the reasons I wanted to write this column in the first place was to make those who do read them aware of the wealth of older romances that are now easily available in digital format. Gallant Waif is a prime example. And Tallie's Knight, a Cinderella story with an unusual hero, is almost as good. Sounds just wonderful! Adding to my TBR! Thanks!! Janga, thank you so much for this lovely review. Gallant Waif was my first book, and so is very dear to my heart. It's lovely to think people are still enjoying it. And yes, it's still available as an e-book. I will have to dig through my shelves of books I have not yet read. This is exactly the type of story I would choose. If I don't yet have it, you can be sure I will be looking for it. Thank you for featuring this book. I agree with you. Her writing awakens your emotions! Excellent author.